Umpires in San Francisco recently debuted a new uniform jacket with sky blue shoulder trim to match the inner collar area in the latest of a long line of umpire uniform advancements. Umpires in Suits = Dignified, Authoritative & Professional. Uniform Evolution - Why the Plate Coat? From the very inception of umpires and umpiring in the 19th century, the most commonly conjured umpire uniform, as well as the first ever instituted, was and is the umpire suit: the first era of umpiring (which extended until approximately the mid-20th century) was all about establishing the umpiring craft as a legitimate profession. In order to establish this legitimacy, the American Association and National League independently came to the same conclusion: umpires needed professional looking uniforms and nothing said "professional" quite like a suit (whether black or blue wool, the core concept of a suit [or "sports jacket"]). 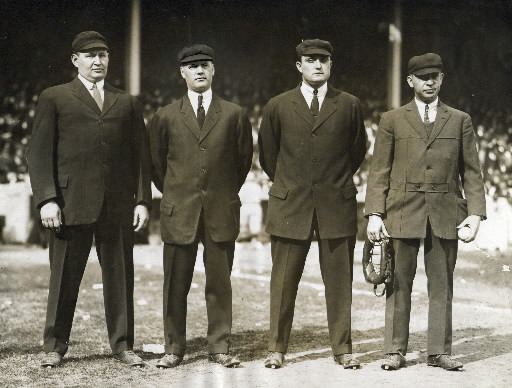 The very first umpires (then-referees) wore full suits: pants and coats cut from the same fabric, collared shirts, ties, and hats. From there, and as protective equipment such as chest protectors and masks were introduced and evolved, so too did the umpires' uniform scheme. 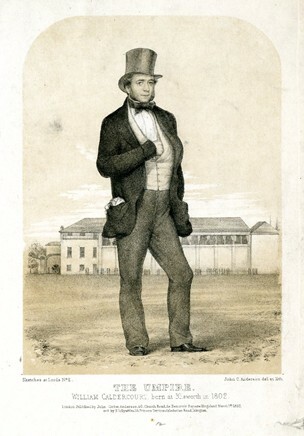 The Umpire William Caldercourt (1852). Print @ The British Museum. Victorian-era top and bowler hats gave way to turn-of-the-century "sunshade hats" to accommodate protective headgear while allowing umpires to shield their eyes from the sun without having to use shade umbrellas. University-style caps made their way onto field umpire heads while Boston-style caps (which have a shorter bill) were favored by plate umpires needing a smaller hat under their facemasks. Eventually, the hats were standardized and stamped (embroidered) with the governing league's emblem or logo. First, a note about umpire suits. A suit is comprised of at least two components: a matching pant and jacket, cut from the same fabric. On metaphorical "Day One" of umpiring, suits were the norm. Slacks gradually became larger to accommodate the plate umpire's shin guards, but would no longer match the upper coat. At one point, the National League experimented with white trousers (similar in a sense to football's knickers), but umpires tired of players kicking dirt on them in order to dirty the pants, a manager-umpires argument stereotype that persists to the present day. At one point, baseball attempted a return to blue pants (the color of umpire's authority), but ultimately, the pants were colored heather and charcoal gray in order to camouflage any potential dirt stains while preserving the dignified suit slacks look. Ball bags were eventually accessorized and hung along belt loops in colors generally matching that of the uniform shirt, while the belts themselves were (and are) occasionally outfitted in patent leather, which draws further attention to the umpire's dignified posture in wearing a visible belt (as opposed to, say, a necktie). Yesterday's tie is today's belt buckle. To accommodate umpire mobility, the suit's necktie eventually vanished due to its constrictive nature. Plate Coat: The ultimate symbol of dignity. Umpire suit jackets became larger blazers (especially for the plate umpire) to accommodate greater equipment requirements, before transforming into sport coats with large pockets to hold spare baseballs. Blue was the predominant color of the umpire's upper wear during its early and mid-20th century evolution, though the American League experimented with maroon blazers and plate coats in an attempt to distinguish its staff from that of the National League, while both leagues took their logos and placed them in patch form on the shirt's left breast quadrant. As for shirts, suit-era stiff collared shirts evolved into chest protector-accommodating button-down shirts, which were replaced wholesale by more flexible polo-style shirts in the later 20th century. Shirts retained their white or light blue shade largely until umpires on the bases were no longer mandated to wear dark blazers over them. 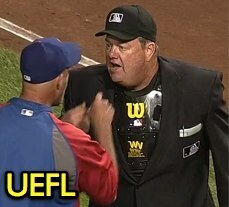 When this piece of heavy outerwear left the base umpires' wardrobe entirely, they were replaced by black polo shirts. 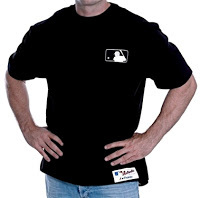 Even something so seemingly minor as the umpire base layer tee-shirt or turtleneck has a story behind it. In the early 1970s, NL umpires began to wear black turtlenecks under their blue outer blazers in an attempt to replace the stiff collared shirts with something more flexible and comfortable. Dark T-shirts came on the scene during this era, and the layered look was born out of a desire to replicate the dignified suit appearance of baseball's early years. In recent years, Majestic Athletic, who manufactures umpire attire, made the gradual switch from contrast color piping along the collar (e.g., the two thin white lines on the black polo shirt's color) to a solid black shirt with no piping/contrasting color, to a black polo with a single vertical white line along each side panel (or black piping on a blue polo), to the modern black polo with grey trim along the collar, button, and placket areas, with a grey side gusset and extended grey panel of dry wicking material in the lower back (for breathability, with a black trim/gusset/panel—blue polo combo as well). 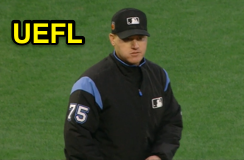 Around this time, umpire outerwear evolved as well, from a black heavy weather jacket with powder blue shoulder rings, to an all-black model, and, now, a return to blue shoulder trim—albeit, with updated collar and placket blue coloring to match. The newest ('17) umpire jacket with blue trim. The main cosmetic difference between the all-black "lightweight" jacket and black-with-blue trim "heavy" one is that the black-and-blue model gives the appearance of layering, the salute to days of multiple components coming together to create a dignified-looking umpire suit. All-black is more "lightweight" and, thus, more appropriate for warmer weather that nonetheless requires a jacket. This uniform evolution may seem purely and superfluously cosmetic in nature—and a lot of it is—but a good amount of the upgrades are dedicated to increased comfort, durability, breathability, and utility, whether to keep umpires cool with moisture-wicking and breathable polyester/elastine waffle fabric in the warm sun or to keep umpires warm with thermal fleece-lined jackets during cold nights. And, as the record demonstrates, much of it adheres to tradition, which brings us back to the plate coat, the single greatest tribute to umpiring uniform history.